We’d love your help. Let us know what’s wrong with this preview of The Paradox Room by Monte Cook. The Strange is a place where fictional worlds, called recursions, become realities of their own. Recursions are unique but limited worlds with their own laws of science and even magic, seeded into the dark energy network underlying reality called the Strange. Some recursions contain extravagant sorcery, imprisoned devils, and lost gods. Others are populated by creatures th The Strange is a place where fictional worlds, called recursions, become realities of their own. Recursions are unique but limited worlds with their own laws of science and even magic, seeded into the dark energy network underlying reality called the Strange. Some recursions contain extravagant sorcery, imprisoned devils, and lost gods. Others are populated by creatures that were never human, born of the fiction of somewhere else. Each recursion is a place of wonder, but each risks drawing the attention of vast entities that scuttle through the primordial reaches of the Strange like bloated spiders on a web: voracious planetovores that eat worlds—recursions and prime worlds (such as Earth) alike. 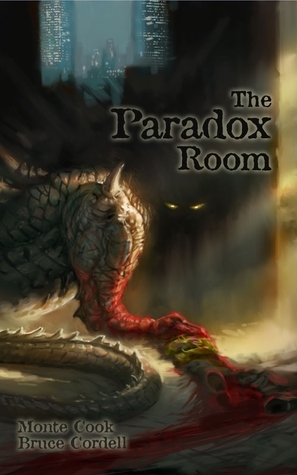 To ask other readers questions about The Paradox Room, please sign up. The fiction is decent, not great, and theres at least a little material for those trying to get an intro to The Strange, but Cook's story forces about 7 technical terms into one expository sentence from hell, and Cordell's story is both too brief and also never names the recursion. Its not Ruk for sure. It just seems to set up a system where people randomly fall into random wacky recursions. I feel like this game is basically going to be a MadLib. Sadly, I've read better work by both of these authors. A short collection like this is ideal for introducing the reader to the setting. The first story has some shining moments as it subverts the expectations of the reader, and the second story has the beginnings of an interesting character. However, the quality of the writing is lacking. Monte Cook started working professionally in the game industry in 1988. In the employ of Iron Crown Enterprises, he worked with the Rolemaster and Champions games as an editor, developer, and designer. In 1994, Monte came to TSR, Inc., as a game designer and wrote for the Planescape and core D&D lines. When that company was purchased by Wizards of the Coast, he moved to the Seattle area and eventually became a senior game designer. At Wizards, he wrote the 3rd Edition Dungeon Master's Guide and served as codesigner of the new edition of the Dungeons & Dragons game. In 2001, he left Wizards to start his own design studio, Malhavoc Press, with his wife Sue. Although in his career he has worked on over 100 game titles, some of his other credits include Return to the Temple of Elemental Evil, The Book of Eldritch Might series, the d20 Call of Cthulhu Roleplaying Game, The Book of Vile Darkness, Monte Cook’s Arcana Evolved, Ptolus, Monte Cook's World of Darkness, and Dungeonaday.com. He was a longtime author of the Dungeoncraft column in Dungeon Magazine. In recent years, Monte has been recognized many times by game fans in the ENnies Awards, the Pen & Paper fan awards, the Nigel D. Findley Memorial Award, the Origins Awards, and more. A graduate of the 1999 Clarion West writer's workshop, Monte has published two novels, The Glass Prison and Of Aged Angels. Also, he has published the short stories "Born in Secrets" (in the magazine Amazing Stories), "The Rose Window" (in the anthology Realms of Mystery), and "A Narrowed Gaze" (in the anthology Realms of the Arcane). His stories have appeared in the Malhavoc Press anthologies Children of the Rune and The Dragons' Return, and his comic book writing can be found in the Ptolus: City by the Spire series from DBPro/Marvel. His fantasy fiction series, "Saga of the Blade," appeared in Game Trade Magazine from 2005–2006.